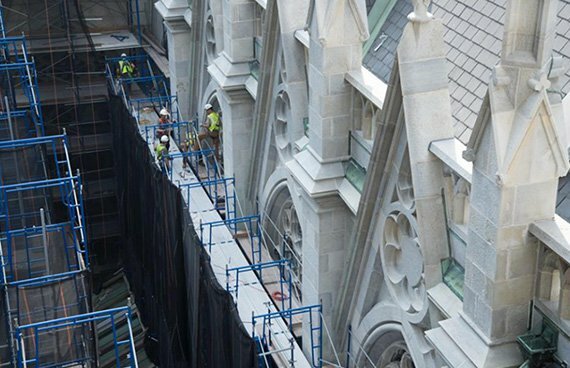 When restoring New York's historic Fifth Avenue Presbyterian Church, Ford 3 Architects and Deerpath Construction used Fieldwire to track and communicate defects in real-time. Time can shape a building just as it can a person. Despite its strength, a historic building is just as susceptible to the passage of time as our own elderly, and requires the same amount of care. This is certainly true of the Fifth Avenue Presbyterian Church in New York City, which has stood as a testament to craftsmanship and resilience since 1875. Over 140 years of harsh winters and general wear-and-tear had begun to loom large on the old church spires. To save them from the grip of time, time-tested skill was required. That tremendous skill would be provided by a pair of talented construction teams: Ford 3 Architects and Deerpath Construction Corporation. Based out of New Jersey, the architects at Ford 3 have a knack for finding the balance between historic and contemporary influences, which made them ideal for the FAPC project. 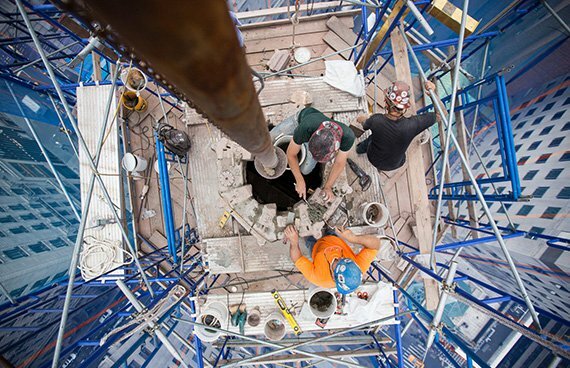 Similarly, with over 40 years of masonry experience under their belt, Deerpath Construction has delivered high-quality work on landmarks across New York City. Together, their hands were the perfect fit for restoring the old stones at Fifth Avenue. As you might expect, a church so deeply rooted in the past had the evidence of those years reflected on its exterior walls. When Katherine Frey, Preservation Architect at Ford 3, first set eyes on the building it was clear there was much work to be done. 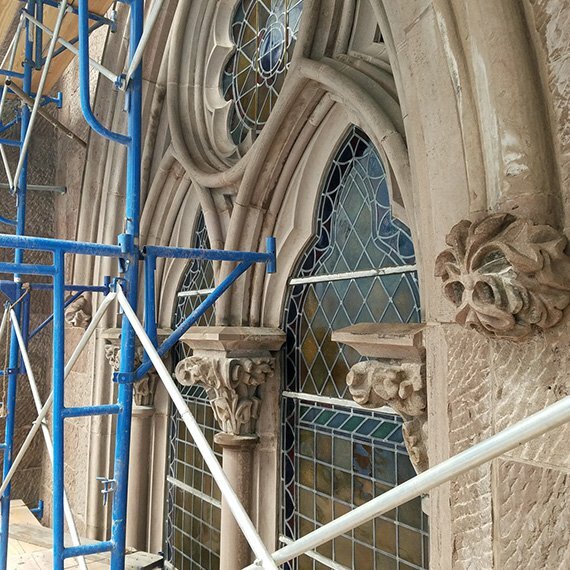 The FAPC project primarily involves brownstone restoration along with exterior window replacement for both of the main structures on the property, as well as the parish house attached to the back of the sanctuary. With so many nooks and clefts to assess, Frey sought a tool to help make her inspections less burdensome. Frey could now survey the outer walls and instantly upload her photos of the damages. That was a big help to her colleagues at Deerpath Construction, who could then track each item with newfound clarity. Matt McGarry, the Project Manager at Deerpath, found Fieldwire remarkably helpful for documenting and delegating the structural repairs to his team. All of the damaged patches of stonework would be marked out in advance and synced to his crew’s mobile devices, which was especially handy after time additional surveys yieled a need for additional repairs. With a growing list of repairs from base to pinnacle, the FAPC teams found the simplified coordination offered by Fieldwire quite beneficial. Frey would perform her survey each week as new scaffolding was erected, share it with Deerpath via Fieldwire, and the contractor would take it from there. All of her notes and photos would be included in the tasks she created on the church drawings in-app. The contractor could add new notes and photos as each repair was completed. Having a comprehensive record of all the repair progress made signing off on each completed task easier than ever, as was managing all of the additional costs from the unexpected items. The Ford 3 and Deerpath crews faced many hurdles atop the aged church, but communication was never a concern. Their correspondence was both tracked and improved thanks to Fieldwire’s real-time notification system, which let Frey and McGarry know when a task had been updated with new content. This saved them the trouble of checking back in with those assigned to specific repairs. The software keeps a living transcript of comments, photos, and any information included within tasks, housing everything in one convenient place. The real-time notifications helped streamline McGarry’s workday by allowing him to easily monitor everyone else’s labor. Every new entry left by his team in the task content would include a date stamp and the name of the person who made it, so accountability was never an issue. It also allowed him to communicate on the fly with anyone across the job site. “I think Fieldwire speaks for itself,” says McGarry. “Going back and forth with Katherine would have been a lot more difficult, trying to quantify and locate all the repairs. Fieldwire really made everything a lot easier and helped us be very precise. "Instead of having to go up hundreds of feet on scaffolds each day to track repairs, I could have one of our guys already up there use an iPad to input their progress in real-time, which is awesome. I’d know right away when something was finished." While it was the efficient functionality of Fieldwire that first attracted Frey and McGarry, it was the ease-of-use that led to their full adoption of the construction app. Project management techniques in this industry can often be as old as the FAPC itself. When a practical, modern solution appeared that could replace those dated methods with a simplified process, converting to the new option was an easy decision. The ability to learn the core features of the app without detailed instruction prevented any confusion or loss of time when first laying hands on Fieldwire. For McGarry in particular, all it took was some prodding to learn the ropes and quickly become savvy not long after. The minor effort required to successfully implement Fieldwire paid off big, saving untold amounts of time for Ford 3 and Deerpath. No more compiling data from multiple sources, no more relaying information verbally, and no more distributing it to others manually. All they had to do was draw from the wealth of data they had already entered into Fieldwire. Having one intuitive tool to house everything related to the project proved to be a winning strategy. 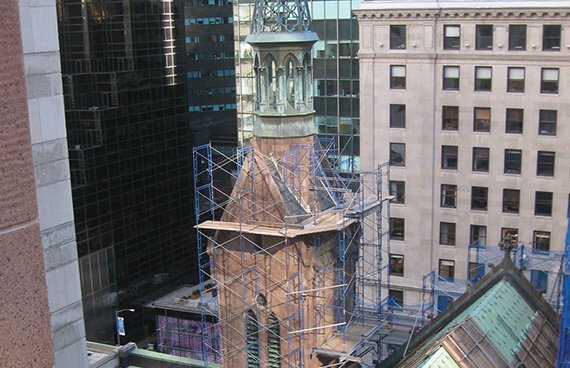 The restoration of the Fifth Avenue Presbyterian Church is nearly complete. If the weather behaves, the last of the repairs will wrap up and all of the exterior scaffolding will be taken down by Thanksgiving. With only a month or so left on the job, the Ford 3 and Deerpath teams have the finish line in sight. Thanks to Matt McGarry and Katherine Frey, and the expertise of their colleagues, the wounds left by time on this historic church will soon be healed. Their industry know-how, along with some help from Fieldwire, ensures that the FAPC will be preserved for another century, if not longer.